The Old English custom of wassailing meets modern-day downtown Blissfield Friday evening as the second annual Wassail Festival sponsored by the Blissfield Rotary and hosted by the Blissfield DDA/Main Street Program gets underway. Wassailing takes place from 5-8 p.m.
One of downtown Blissfield’s newest events adds merriment to the already festive-looking downtown as participants get to taste 11 types of wassail, a mulled or spiced wine and vote on their favorite one. Wassail will be served by Bailey Chiropractic, Blissfield Living, Cakes n’ Shakes, Decades, Joan and Co., The Packrat, Royal Expressions, TLC, United Bank and Trust, Victorian Gardens and B-Town Bar & Grill. Caroling and bonfires will also be an attraction this year. The Blissfield DDA/Main Street Program has teamed up with the Blissfield Rotary Club and local winery J Trees Cellars for the event. Those who want to participate can purchase their commemorative 2012 Wassail Festival ceramic mug for $12 at the Blissfield Village Office or the Historic Depot before Friday. For those who are holding out that one of the 250 mugs may be left Friday evening can visit the DDA/Main Street “Welcome Booth” in front of Mohr’s Barber Shop, 122 S. Lane St. Those purchasing a mug will also get a punch card for rating each wassail as well as a wristband and a map including the participating locations. Those participating need to be 21 years of age or older. A 5K race will begin and end in the downtown as well. Please see related story on this website about the Hot-Cha-Cha 5K Mug Run. Also keeping with the medieval theme, the Cunnabar Collegium Musicum carolers, dressed in medieval costume, will sing traditional Christmas songs. The evening culminates at the b-Town Bar & Grill where the trophy will be awarded to the business with the best wassail of the evening. Chuck Cory, the Rotary liaison to the Wassail Festival said the club’s “Free Gas for a Year Raffle,” ticket will be drawn following the award to the winning wassail maker. Wassail is a traditional English beverage. Its customs date back to the Old English tradition to toast to their neighbor’s good health and for the hope of a prosperous harvest in the coming season especially an apple harvest. Copyright 2012, River Raisin Publications, Inc. For the complete story, please see the Dec. 12, 2012, edition of The Advance. 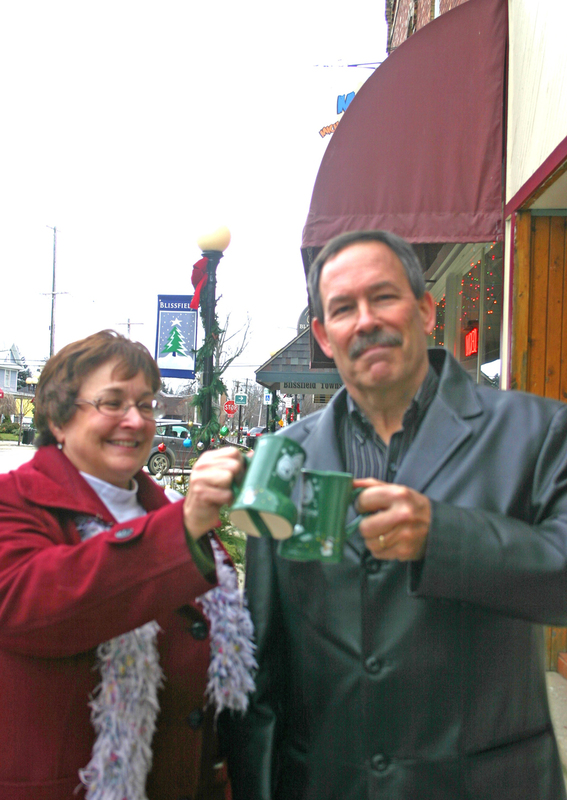 Patricia Rayl and Chuck Cory toast to Wassail Fest in Blissfield.